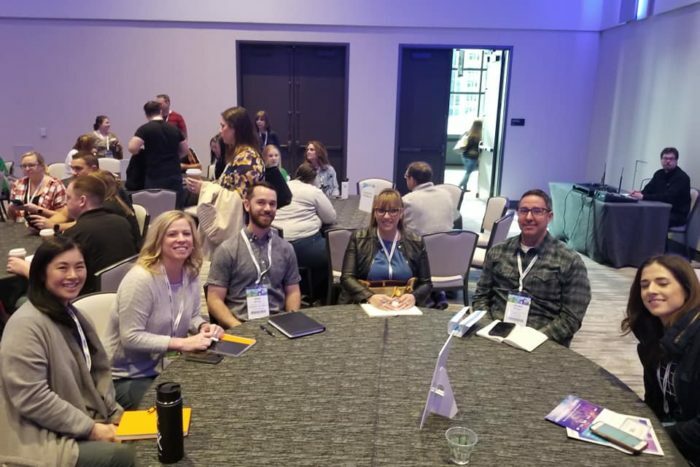 I recently attended the 2019 Spring SourceCon Conference in Seattle, and as always it was a great time of learning, socializing, and hijinks. There were faces new and old. I saw friends that I had not seen since leaving the DC metro area, and it was fun to reminisce with them between sessions and networking events. I witnessed and learned a lot at SourceCon. This is a story about what I saw and participated in with the next up and coming generation of sourcers. I’m proud of this SourceCon family that allows me to be a part of it. At SourceCon, it’s common to see a group of people sitting on the floor in the conference hallway. Usually, it’s because a tables fill up so quickly and one of the senior sourcers will say, “lets chat over here,” and others will come, and the sharing begins. These are the often unsung heroes of SourceCon; they are the mentors not thought leaders. These are folks that work on the front line or are consultants who are paid to give training to corporations for a living, and you have access to them for two and a half days. On the second night of the conference, there is a contest called The SourceCon Hackathon, and it is a blast. It started with the first SourceCon (then called After Dark) and has been going strong ever since. Some were afraid to participate though, even though it is free, as failure can be intimidating. To me there is no failure; really it’s just another chance to learn and grow. Yet, if you do not have even the basic tools, you are going to be in trouble. That is where this story begins. I know finally right? There were two rooms this year in Seattle for the Hackathon. One room was for newish sourcers or ones just starting out, and the other was for the more seasoned sourcers. It was a brilliant move as there were many participants in both rooms. I usually hang out for the beginning then I head out to dinner, but this time I reversed it and grabbed dinner early. I like to hang back and watch the action. As I was doing so, I overheard a conversation between some young ladies wondering what they were looking at on the screen that Mark Tortorici was using to show the Boolean string he was sharing on how he solved the first question. They were nursing recruiters and thought that what they were seeing was code. I giggled and turned to tell them it was a Boolean string, and that is how we found information on the internet. They stared at me as though I was speaking Italian, which is pretty cool if I was, I have always wanted to learn that language. I digress. One of the ladies asked if I knew how to do that. I just smiled and told her to grab a seat. Now, I have been out of the game for over a year consulting Engage Talent on cleared recruiting and engagement emails, so I had to remember some things but it came back pretty quickly for me, and I showed her some necessary strings. After a few tries, we hit the motherlode page with bios and contact information for what she was looking for. It took about 10 minutes. She was hooked and looked me dead in the eye and said this small kernel of knowledge was one of the best things she could have ever seen. I then gave her some websites and books she could read and follow, including this one, to help continue her education. We shared contact information right then and there. She got up to join her friends then stopped and turned to face me. She smiled, tilted her head and asked very politely that if she ran into issues could she contact me. I laughed and said, anytime. That is it folks, those that have learned from those who know things should begin to pass on the information that you have learned. We as a community share information not for pay or prestige. We share tips, tricks, hacks, etc. because this is a family and family helps family. Derek Zeller draws from over 20 years in the recruiting industry. The last 16 years he has been involved with federal government recruiting specializing in the cleared IT space under OFCCP compliance. Currently, he is the Director of Recruiting Solutions for Engage Talent. He has experience with both third-party agency and in-house recruiting for multiple disciplines. Using out-of-the-box tactics and strategies to identify and engage talent, he has had significant experience in building referral and social media programs, the implementation of Applicant Tracking Systems, technology evaluation, and the development of sourcing, employment branding, and military and college recruiting strategies. Derek currently lives in the Portland area. Now, he is the Director of Recruiting Solutions and Channels with Engage.